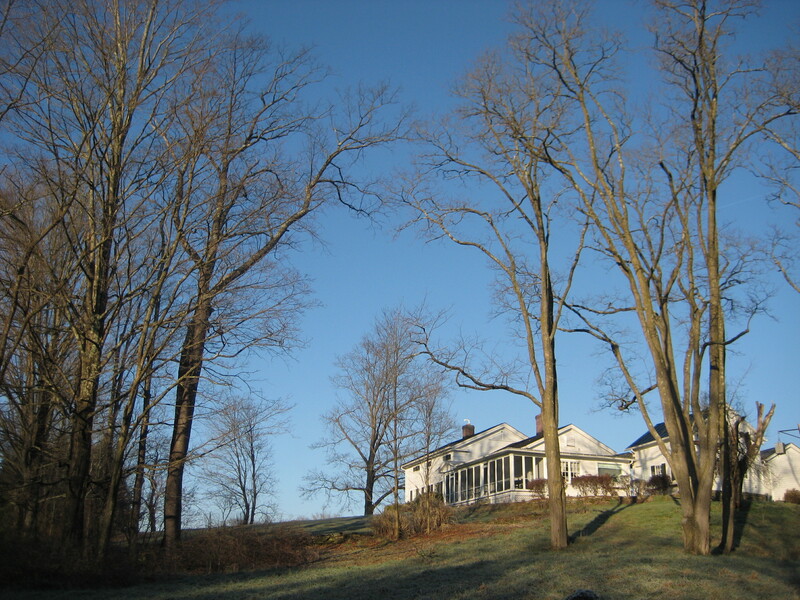 Honesdale, PA. A day of bright sun at the Highlights Foundation at Boyds Mills, a wonderful writers’ retreat. Sunny and clear, but cold. Almost winter now. The leaves are all off the trees. The winter is coming, the branches are stark and bare. The leaves of these elegant gray trees just don’t know when it’s time to quit. 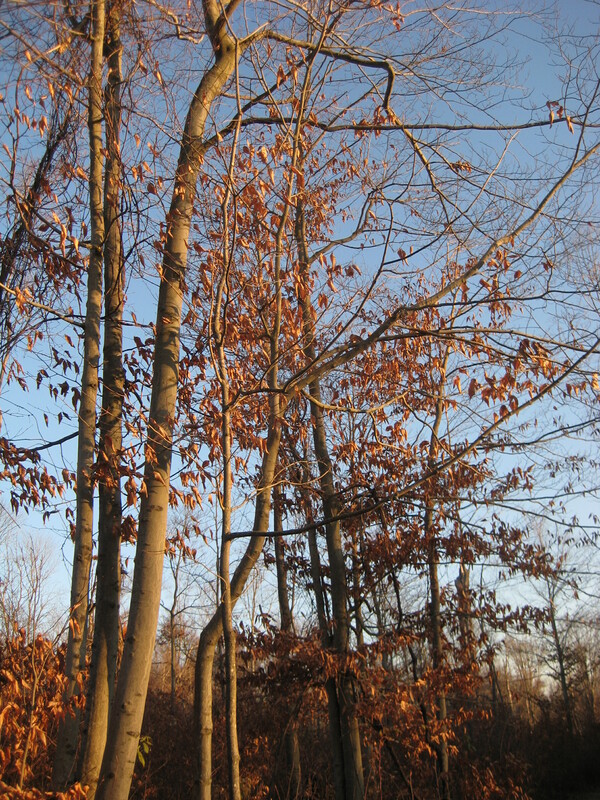 American Beech, Fagus grandifolia. Why? Like most nature questions,this one has as many answers as there are websites. 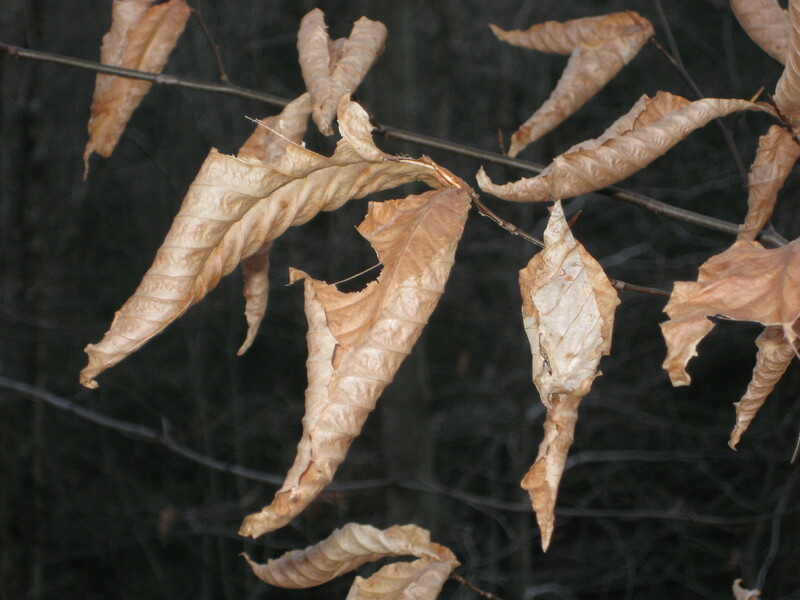 The trait of keeping leaves after they’re dead is called marcescence. (A word that is surely in the finals of all spelling-bees.) 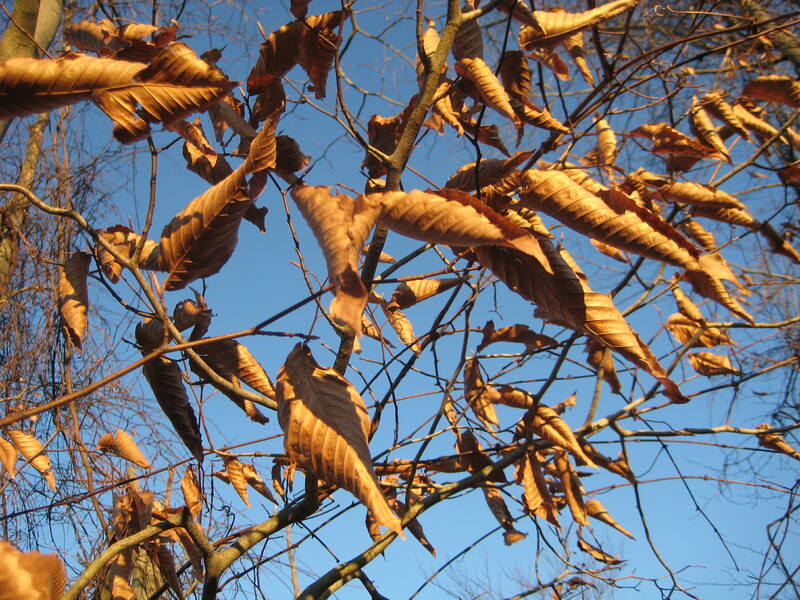 Botanists debate why only few species of trees, notably the closely-related oaks and beeches, have this trait. Is it a habit that the trees are in the process of losing? Perhaps they’re evolving on the way from evergreen-ness to deciduousness? Marcescence could be a negative trait, but one that isn’t a huge obstacle to survival, so it’s being lost, but slowly. Perhaps someday far in the future beech leaves will fall off like the maples and birches and all the rest. Or is marcescence (okay, I’m not spelling that word again) an adaptation for survival? An advantage during the cold winters of these Pennsylvania hills? Maybe it protects twigs from winter munching by deer. Maybe it discourages insect damage. Or protects buds against frost. Or maybe the answer is all of the above. No one will know for sure for a few hundred thousand years. 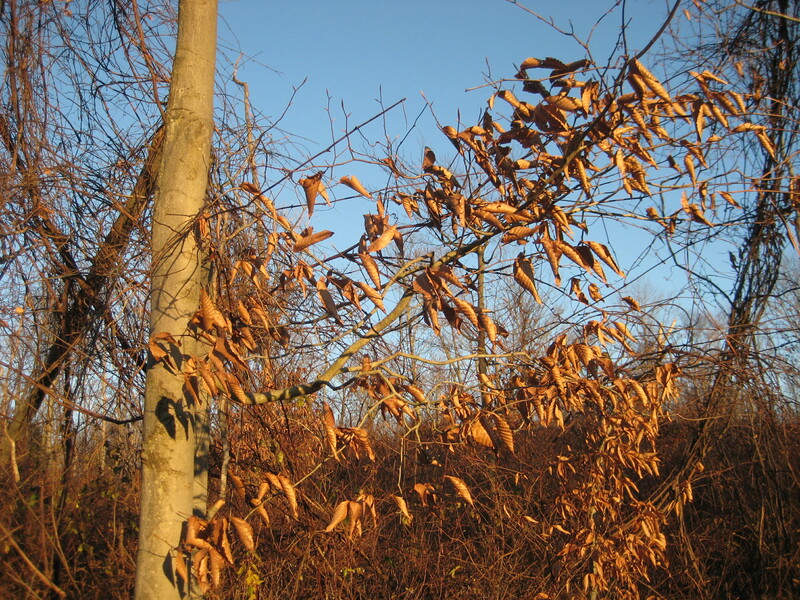 Beech trees are in trouble these days in the Northeast, battling a plague called Beech Bark Disease. It’s caused by a tiny, soft-bodied bug called a scale insect (accidentally imported from Europe in the 1800s) that weakens the tree by feeding on the liquids of bark cells, and also spreads a deadly fungus from tree to tree. I’m seeing the sad sight of more and more dead beeches. But even with the disease, individual trees can last a long time, sending out new limbs and leaves that hang on even when the game is up. And whatever the reason for those papery skeletons of leaves, they are the music of November. The brittle leaves move in every breath of wind, and tap against each other, making a sound that’s hard to describe. Chattering teeth, perhaps? No, more like rain on the roof. Distant castanets. Or maybe it’s just the sound of the trees talking.